That said, I wouldn't say no to having both. ..........or the 240Z. Why not have all three?! I would have it tomorrow but perhaps in Azure blue. That said not a massive uplift in Bhp from stock Nismo wonder what they can get out of it if they try a little harder. Also shows the stock 6 speed is able to take the extra power. I wonder how much the kit would cost + fitting to a RHD car. Going the supercharger route might be a fair bit cheaper, for similar performance? I think supercharging the current engine would be much cheaper, and give better performance. The question is how hard can you push the 3.0l TT and what performance will that give as 400BHP is a little on the conservative side. And saying that it's possible and fairly easy, so Nissan could in theory perhaps do it themselves. Nissan did build the 370z Nismo RC for a while - thats no longer available from Nismo. So I guess this is something to fill that gap. A track day car that you can take a Standard 370z Nismo and tweak, but this won't be a cheap upgrade - whats the Engine and ECU alone? Plus other bits. I think what blobbish is saying is right, you could hand this to any number of our traders and they could turn out a 400bhp Nismo with no real effort. However if they were testing if the Infiniti TT engine could be a new model with a manual gearbox - and keep the 370z going for a few more years - then that test has told them what they needed to do. 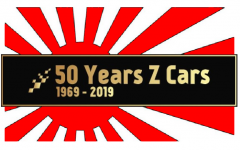 Perhaps we have seen the 50th Anniversary Model in prototype form after all they are selling more Nismo models than any other in the range - 370z with a TT engine - after all that is what everyone has been asking for. And the original V1 Nismo was originally designed by enthusiasts - Nissan asked them what they wanted and what it would look like. So its been done before. Also the V2 was released not at a mainstream car show - it was released at a Z Fest in North Carolina in the US. So again its not a precedence to test run a new model at a enthusiasts show in the US first. I very much hope this as a project car / mule for a future (most likely watered down) version. I'd also like to think that they've mated the gearbox to the engine in such a way that it allows for a RHD version. All they need to do now is fit a new infotainment system and it would really bring the car up to date. It's interesting that the Nissan press release says it's running 18" wheels (I don't think it's a typo).